OUR CROSS-LINKERS CAN CONSIDERABLY IMPROVE HYDRAULIC FRACTURING PERFORMANCE, THEREFORE INCREASING WELL PRODUCTION RATES. Aubin's track record at developing cross-linkers is seen across each area of our business. Our team has developed cross-linker additives for fracturing operations used to activate gel systems. Aubin offer three crosslinking agents specifically designed to work with guar and HPG based fracturing fluids; FX-10, FX-11 and XLB-10. See the table below for physical properties. When cross-linking agents are added to linear gels, the result is a complex, high viscosity fracturing fluid that provides a much higher proppant transport performance than linear gels. Cross-linking reduces the need for fluid thickener and extends the viscous life of the fluid indefinitely. 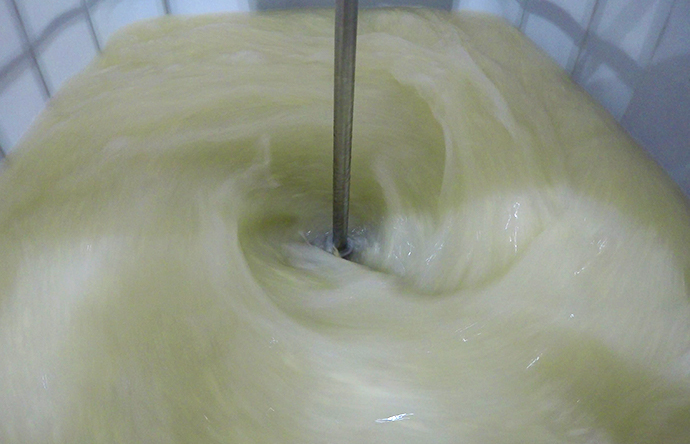 The fracturing fluid remains viscous until a breaking agent is introduced to break the cross-linker and, eventually, the polymer. Cross-linkers can considerably improve hydraulic fracturing performance, therefore increasing well production rates.